EDINBURGH CAPITALS player-coach Riley Emmerson believes tomorrow’s game at Manchester Storm “is all about redemption” as his side look to put on a much better showing than last month’s 8-1 capitulation at the Elite League new boys’ Altrincham rink. “We had a great win last week over Braehead, and although we didn’t win in Cardiff I felt we still played well, so the mood ahead of tomorrow’s crucial battle is fantastic. It’s all about redemption for us and we’re ready for them. 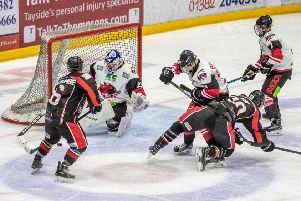 Storm, more synonymous with British ice hockey’s Super League period, folded in 2002, but were resurrected in a matter of weeks this summer to replace the now defunct Hull Stingrays, and blew Edinburgh away in their first ever match in the Elite League. Coached by former Stingrays boss Omar Pacha, Emmerson sees plenty of similarities in the playing style of the two clubs. Edinburgh, who have won two of their last three games, have no injury worries ahead of the weekend double-header – Storm visit Murrayfield on Sunday – and welcome back David Rutherford, the feisty forward having now served his two-game ban picked up in last month’s 5-2 derby loss at Fife Flyers. Emmerson believes it wont be long until Caps fans see the best of the former Central Hockey League All-Star. He said: “It’s huge to have David’s energy and experience back. He’s not even started heating up yet, we’ve brought him over to be a big points scorer for us like Ryan Hayes is this year. He’s the sort of guy that can produce goals or assists out of nowhere. Yes, he plays with some chippy-ness, he plays with his heart on his sleeve, and wants to get under the skin of his opponents, he’s a great player and when he gets going he scores in bunches. Under Emmerson, Edinburgh are still a work in progress, but their end-to-end 100mph hockey is starting to turn a few heads, and the rookie coach is pleased with how his team is shaping up for the long season ahead, and also praised the improvement of his local players.